PREP was designed to streamline the state’s portfolio of economic development programs, and also encourage the development of new regional approaches to program management and delivery. It directed that a number of the state’s leading economic development entities, the Industrial Resource Center network (IRC), the Small Business Development Center network (SBDC), the state’s seven Local Development Districts(LDD), and the many industrial development organizations that operate at various local levels, come together to develop new regional partnerships to share services and activities. Small Business Development Centers at the University of Scranton and Wilkes University. 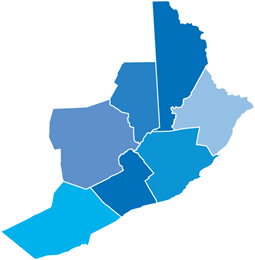 Local Industrial Development Organizations: Berwick Industrial Development Association, CAN-DO Inc. (Hazleton), Carbon County Economic Development Corporation, Monroe County Industrial Development Authority, the Pike County Economic Development Authority, Schuylkill County Economic Development Corporation, Scranton-Lackawanna Industrial Building Company, and the Wayne Economic Development Corporation. As a hub for the region’s business support organizations, NEPA PREP provides a powerful network of regional experts who can help business owners address nearly every type of challenge facing their companies. In addition to the services provided directly by specific PREP partners, the network can also help firms access critical state and federal resources, such as loans, grants, technical assistance, or other support. Each year, the NEPA PREP partners provide services to approximately 1,000 local customers, primarily local businesses but also individual residents who are looking to learn about business start-up and management.